Zinda Bhaag, which remains Pakistan’s most celebrated cinematic export in recent times, is led by a trio of unknown, inexperienced actors. The lead actor Khurram Pataras was a clothes salesman before he was nudged in the direction of the camera. But don’t write him off, just yet. His portrayal of a twenty-something Khaldi, desperate for a visa to the United Kingdom to escape the drudgery in Lahore, is moving. 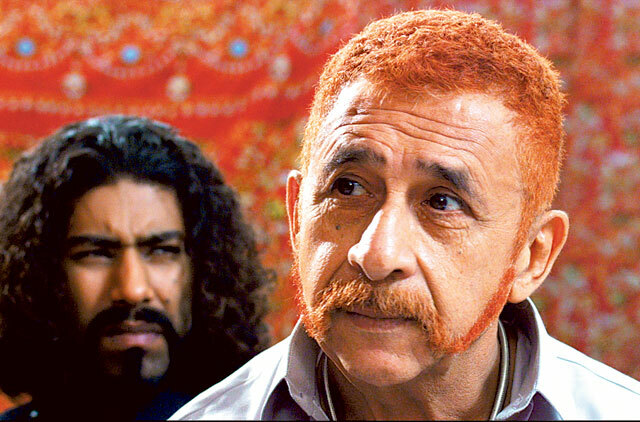 Barring veteran Naseeruddin Shah, who plays an orange-haired local goon, every young thing in that neighbourhood considers the West as a passport to freedom. And they are willing to go to any lengths to secure that elusive document. These men don’t bat an eyelid when it comes to forging passports or securing a berth on an illegal ship as human cargo to reach their promised land. But what makes this Punjabi-language drama engaging is that their realities are grim, though it is narrated in a way that doesn’t weigh you down. The drama begins by introducing us to Taambi (Zohaib Asghar), Chitta (Salman Ahmad Khan) and Khaldi (Pataras) who are just like any other twenty-somethings out there. They love to drink, love girls and attend funerals just to dig into the chicken curry that is served after the wake. Their camaraderie doesn’t look forced, but the mood changes as the movie progress. We are introduced to a typical large Pakistani household, where mothers and grannies are glued to a hilarious television soap about a man with two wives called Auqaat, but dream of their daughters marrying well. Their fears are amplified during commercial breaks. Naturally all their hopes are pinned on their sons to acquire that glossy life. It’s set in Lahore but their problems seem universal. These characters could easily be in Kerala in South India where the Gulf is considered an economic elixir. Supermodel Amna Elyas, as the enterprising Rubina, thwarts the perception that models are wooden. She sells organic soap for a living and is a welcome antidote to all those young boys who look to the West as a Utopia. As always, Bollywood actor Shah keeps his end of the bargain. He runs gambling dens for a living and has warped sensibilities of right and wrong. The way he underplays his meanness is a treat to watch. Plus, his acting workshops that he carried out for the young actors before filming has paid off. While directors Farjad Nabi and Meenu Gaur should be lauded for Zinda Bhaag, I wish they had not introduced Bollywood-style songs into the narrative. It was meant to be kitsch but somehow it derailed the pace and diluted the intensity of the script. With English subtitles and some good acting, Zinda Bhaag speaks to all. Don’t miss this one.